Disclosure: This post may contain affiliate links. Please read our Disclaimer for more information! How do our muscles work? 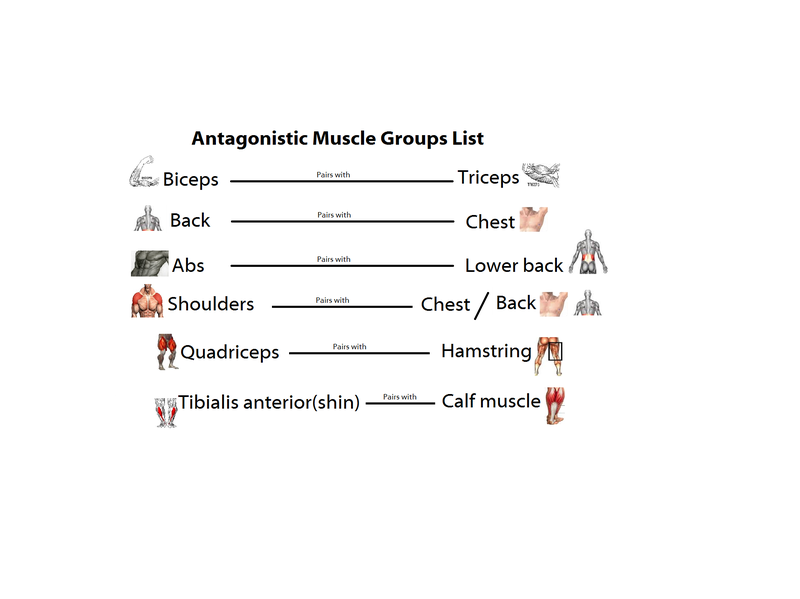 What is an antagonistic pair of muscles. How knowledge about it will help you reach your fitness goals and make your workout better? We will all find answers to those questions in the next lines. There are more than 600 muscles in our body. I am not going to talk about them all but only for these we use everyday and most people think of when we say muscles – Skeletal muscles. They are voluntary muscles, which means you can control what they do. Together the skeletal muscles work with your bones to give your body power and strength. Skeletal muscles are held to the bones with the help of tendons . cords made of tough tissue, and they work as special connector pieces between bone and muscle. The tendons are attached so well, that when you contract one of your muscles the tendon and the bone move along with it. Muscles are normally arranged in opposition so that as one group of muscles contract another group relaxes or lengthens. muscle where one move the bone in one direction and the other moves it back the other way in transmission of nerve impulses to the muscles. That means that it is impossible to fully stimulate the contraction of two antagonistic muscles at the same time. During ballistic motions such as-throwing, the antagonist muscles act to ‘brake’ the agonist muscle throughout the contraction, particularly at the end of the motion. In the example of throwing, the chest and front of the shoulder contract to pull the arm forward, while the muscles in the back and rear of the shoulder also contract and undergo eccentric contraction to slow the motion down to avoid injury. A full body warm up before sport activity is crucial for protecting of injures and better performance. When we workout our muscles contract. That’s a complicated chemical and nervous related process, which I am not going to talk about in details. Muscle contraction needs fuel to turn it in action. A muscle contraction and muscle grow will need proteins, calcium, creatine and carbohydrates as the most important and one we can control through diet. Biceps and triceps are antagonistic pairs. The biceps muscle works across three joints and the most important of these functions is to flex the elbow, while the triceps muscle is the muscle principally responsible for extension of the elbow joint. Shoulder – deltoid muscle, latissimus dorsi – back and pectoralis major -chest are antagonists. Deltoid, or also known as shoulder, is responsible for rotating the shoulder bone and elevating the arm. The shoulder will help you make sets on the press bench carried objects a safer distance away from the thighs to avoid hitting them, such as during a farmer’s walk and a lot more. In that purpose I want you to think of all the activities you do in the gym and out, and you will see that in most you need the help of the shoulder muscle. Be careful with your shoulder and protect them from injures. The back is responsible for more of the pull ups we do, while the chest for the push ups. For better understanding imagine opening and closing the door at work using only your hands without the help of your legs. In order to open the door you will need to pull thanks to your back, biceps and shoulder, and when closing you will need to push thanks to your chest, triceps and shoulder. So as you can see every activity in our body includes a long list of muscles, which are working together and in opposition, helping our body to work properly. Trapezius is a large superficial muscle located on the back under our head and above the back next to the shoulder and spine. The functions of trapezius are closely connected with all the muscles we talked about already. Trapezius supports the weight of the arm, retracts the scapulae, medially rotates and depresses the scapulae. The rectus abdominis (abs) muscle is a paired muscle running vertically on each side of the anterior wall of the human abdomen. Abs and erector spinae (lower back), located in the back next to the spine, are antagonistic pair. Standing from laying position we use our abs, while laying down on our back is done by our lower back muscle. The lower back muscle is a small and weak muscle not very often use in our everyday life. When you are doing crunches you workout your abs, but your lower back plays the role of antagonist muscle and acts to brake the end of the crunch. That’s why you may experience a back pain sometimes after abs exercise. If we look at the muscles in our arms and then our legs, you will see similarity. We have our “leg shoulder” muscle presented by the gluteus maximus – the largest muscle in our body and the one that rotates, extend and support. The gluteus make antagonistic pair with muscles of our abdominal – iliacus, psoas major and psoas minor, which are not big muscles but very important. Our biceps and triceps in the legs are the quadriceps femoris and biceps femoris. Under the knee we have one more important antagonistic pair and that’s tibialis anterior and soleus muslce. The soleus muscle runs from just below the knee to the heel , and is involved in standing and walking. Tibialis anterior is located near the shin int the front part of the leg under the knee. The tibialis anterior is responsible for dorsiflexing and inverting the foot. thank you, this was really easy to read and understand. Thank you, this page is so fun and the avatar so cute. this page really helped me in school.